Wrap up for an evening out with this elegant and quick evening shawl. The Guriddo Stole uses a memorable chart and luxurious Madelinetosh Twist Light yarn to create the perfect wrap for your special event. Get the Guriddo Stole Kit by Sandhya Shadangi, as seen in knit.wear Fall/Winter 2016. It includes three skeins of Madelinetosh Twist Light in court and spark and a copy of the magazine. Knit.wear Fall/Winter 2016 features two stories for the modern knitter: Street Style and Iki. Street Style is full of urban, hip women’s garments and accessories. Iki is a Japanese aesthetic–inspired story that features projects with clean lines, minimal but impactful details, and feminine but austere design. Keeping with the Japanese theme, our feature article is an interview with Takeko Ueki, owner of Habu Textiles, on her yarns and design process. 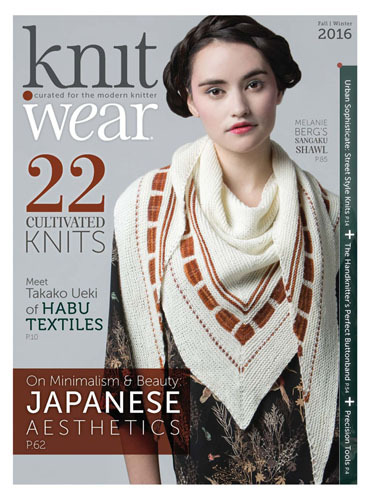 This issue also includes an in-depth tutorial from Sarah Solomon, who has "unvented" her own technique for creating the perfect buttonband; departments that highlight our favorite Japanese stitch and pattern books and sleek yarns; and, as always, knitwear for the modern knitter. 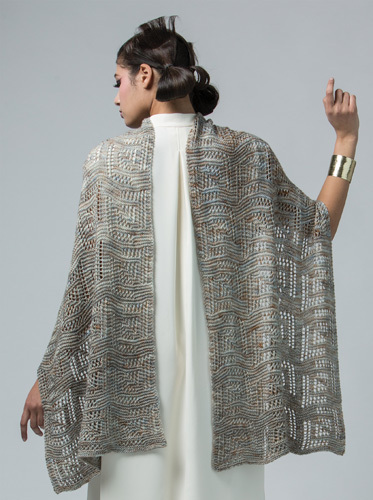 The Guriddo Stole by Sandhya Shadangi is the perfect wrap for warm fall afternoons and an elegant layer for chilly evenings. With an interesting but memorable chart and gorgeous yarn from Madelinetosh, this shawl is a fast and delightful knit. Finished Size: 19" wide and 65" long. Yarn: Madelinetosh Twist Light (75% superwash merino wool, 25% nylon; 420 yd [384 m]): court and spark, 3 skeins. Needles: Size 6 (4 mm). Adjust needle size if necessary to obtain the correct gauge. Gauge: 22 sts and 30 rows = 4" in charted patt. Madelinetosh Twist Light is a delightful sock yarn composed of 75% merino wool and 25% nylon. The yarn is hand-dyed in Texas with ethically sourced wool from South Africa. 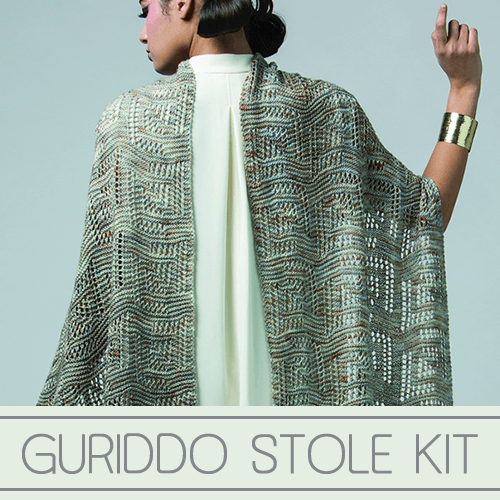 Order your Guriddo Stole Kit today!